PLEASE HELP US PRESERVE A PART OF LOUDOUN COUNTY, VIRGINIA HISTORY!! 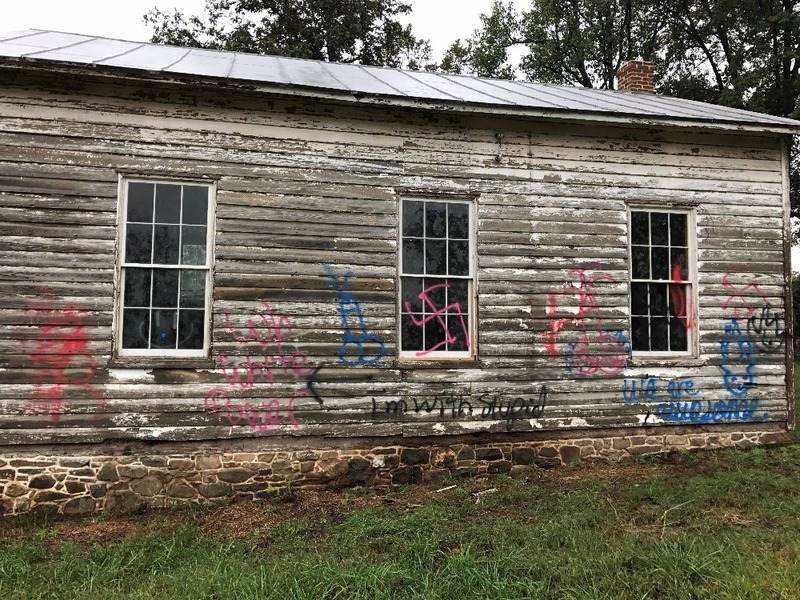 While the picture above may not look like much today, this building was once an incredibly important place for African American children to obtain an education in Loudoun County, Virginia. In 1870, Loudoun County’s first public schools opened with the stipulation that white and African American students would have separate facilities. 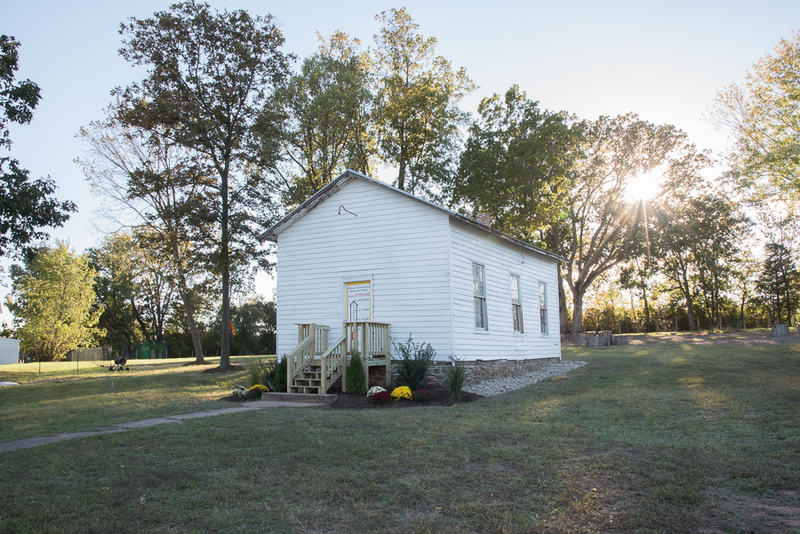 This one room frame building, heated only with a wood stove, was one of nine schools established for African American students in Loudoun County. The school operated from around 1892 to the late 1950s (several years after the Supreme Court decision in Brown v. Board of Education) until Virginia schools were fully integrated. 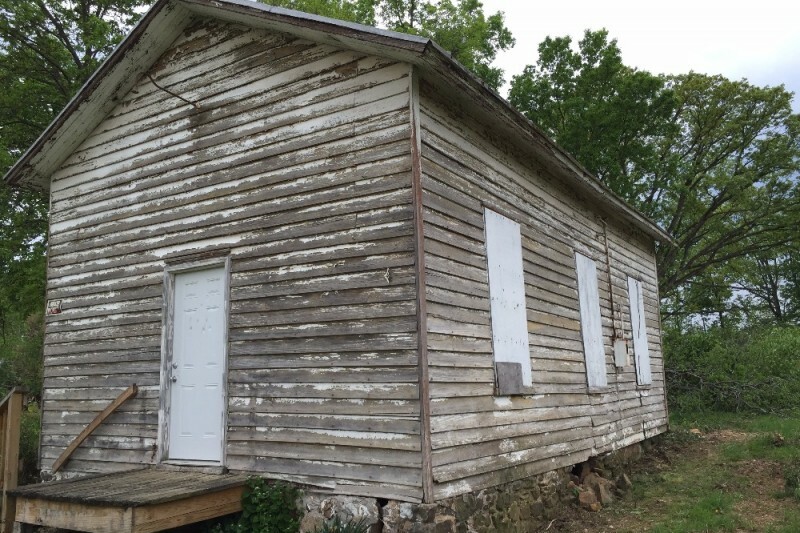 The school, called the “Ashburn Colored School”, had only one teacher who would try to make the best use possible of the facility to educate students who ranged in age from 6 years old to 17 years old. It was difficult at times with no central heating or plumbing but it was a second home for the students who attended. Yvonne Neal, who is 82 now, attended the school from 1938 until 1945 and described how her father would sometimes have to carry his children on his back in the winter for part of their 2.5 mile walk to school, as buses were not available. Read her story here . Loudoun School for the Gifted (a small private school for grades 6 through 12 in Ashburn, VA). We can’t do this alone, and we need our community and those who want to preserve important parts of our history to help us. We want to bring this important building back to life so the public can visit it, and reflect on the past but also see how far education has come since then. Given the schoolhouse’s current condition, there is a lot of work to be done. We have met with experienced restoration contractors and have decided to begin with stabilizing the exterior before we move to the interior. The cost to stabilize and restore the exterior will be approximately $35,000. The total restoration will cost about $100,000, which is a really ambitious goal for secondary school students, so we need your help. We would greatly appreciate any contribution you can make, even if it is connecting us with others who would make a contribution. And, if you have ideas for the restored schoolhouse, please share those as well. Through various fundraising activies, we have been able to raise the first $19,000 needed to rebuild the foundation - thank you to everyone who contributed! Now we are moving on to phase two which includes restoring the original windows, and repairing and painting the clapboard siding. Phase three will be the interior and will begin after we finish stabilizing and weather-proofing the exterior. Framers Projects is a 501(c)(3) organization that we formed to support the efforts of our students to save the Ashburn Colored School and we will happily send you a receipt for tax purposes! Keep Up-to-Date with Our Project! Thanks to the generous donations we have received from you, we are finishing up the rehabilitation of the historic Ashburn Colored School and are ready to have the dedication ceremony. 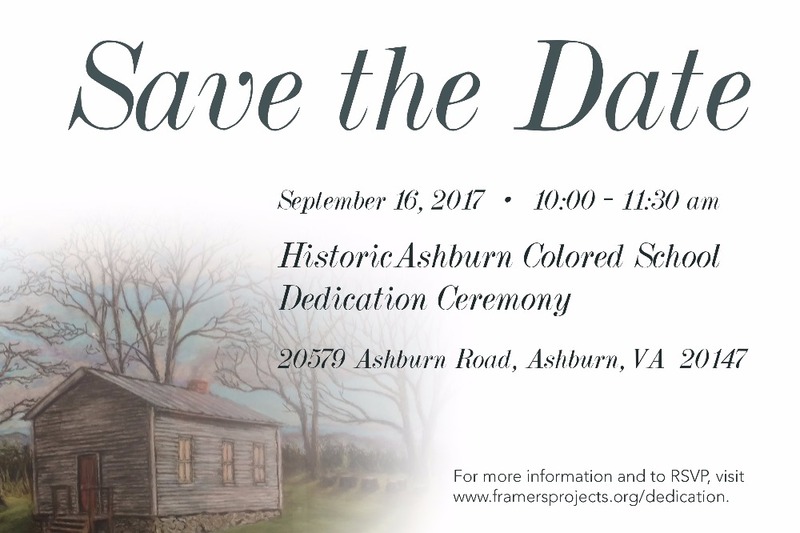 If you live in the Ashburn area, we would love for you to join us for the ceremony on Saturday, September 16th, at 10:00 am at the Old School. We will be posting more information on this event at www.framersprojects.org/dedication as details become available. We can't thank you enough for your support and hope you can join us on the 16th! It is difficult to express the gratitude and joy that we feel after the Community Restoration Celebration day on Sunday. Over 600 volunteers and friends came out to help paint and repair the Old School and the results are incredible! Over the next week, we will share out pictures and stories of our community coming together to erase the hate. Visit our Facebook page - www.facebook.com/ashburnoldschool to view them. We are working to respond to the hundreds of emails that we have received and to thank the hundreds of donors who have contributed. We will continue to invite the community to participate in the rehabilitation as we move to the interior part of the project. 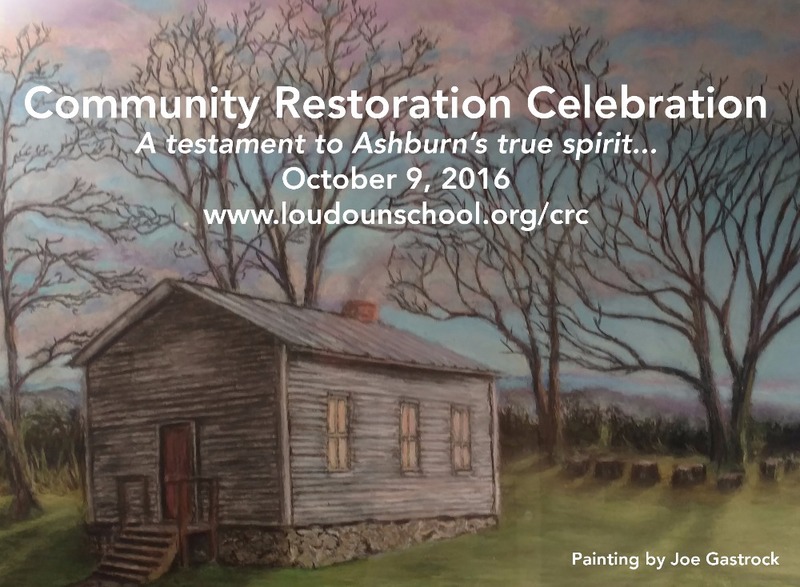 We truly appreciate your support and look forward to sharing the progress of the Ashburn Colored School Rehabilitation Project. Thanks to a final $35,000 donation from the Washington Redskins on Tuesday, we have met our goal of $100,000 and are therefore closing our GoFundMe page. We still have more thank you messages to send out to our GoFundMe donors, but please give us some time because our students want to send them and that will take a while. Thank you very much to all of the amazing people who have reached out to offer their help and/or donate money to support the Old School. It has been incredible to see the community come together to help repair the damage from Friday night. We are having an event on Sunday, October 9th, where everyone can have a chance to pitch in to help remove graffiti and repair/paint the exterior of the Old School. For more information, or to sign up to volunteer, please visit www.loudounschool.org/crc. 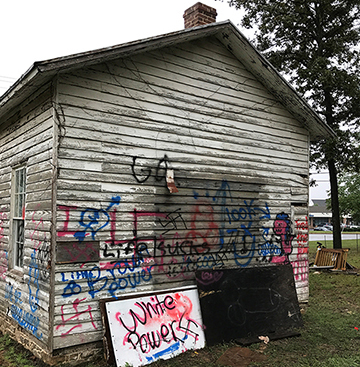 On Saturday morning, we discovered that the Ashburn Colored School had been vandalized overnight. 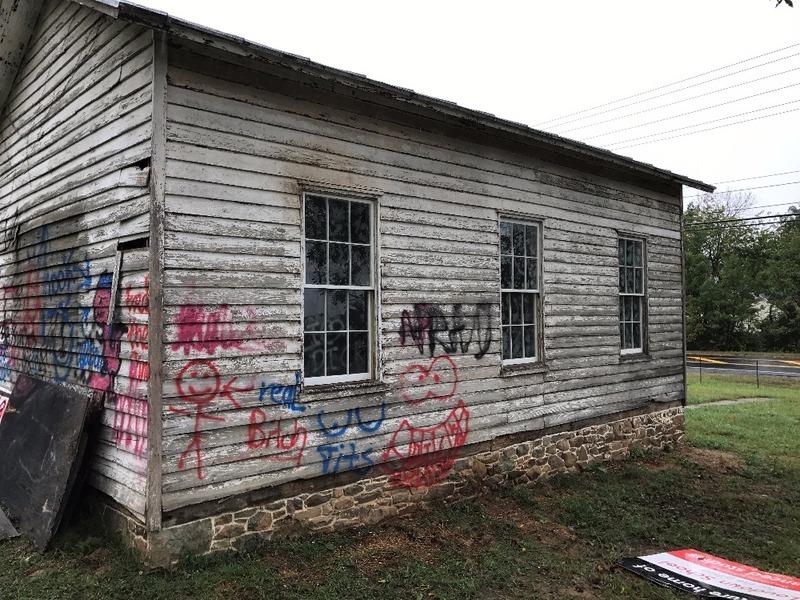 We were saddened to see profanity and racist references spray painted on this significant piece of history ( http://loudounnow.com/2016/10/01/vandals-spraypaint-racist-messages-on-black-ashburn-schoolhouse/). We had just finished installing the new windows, bringing sunlight into the school for the first time in decades. But there is a silver lining to this vandalism, and that is the outpouring of support that we have received from the local community and the wider national and international community! We cannot thank you enough for the donations that have been made to help us repair the damage done by this thoughtless act. We will keep you updated as we work through a plan to not only repair the clapboard siding, but also to begin the interior restoration. I think Matthew Woody has a wonderful idea. And what an educational opportunity it could be... Out of hate, all the community love arose to banish the darkness. Consider leaving a small section of the graffiti for part of the educational experience. It could have an interpretative sign noting that racism is alive and well in 2016. Good luck with the project. What a worthwhile project I was so glad to be a part of it can't wait to see the pictures. There is no place for racism in this great country! What about painting over most of the grafitti until you can figure out how to safely remove it? Every little bit helps! Good luck on the restoration. Can't wait to see the results! Should be on every school kid in the county's bucket list. Be the positive, the light, the good. Love and acceptance will always push away hate. Peace to all.